If you teach a class that requires students to memorize information, then you have probably worked with students on developing strategies for memorization. I often tell my anatomy students that they might forget some of the details of what they have learned, but study strategies will stay with them through college. I could get into a discussion about the merits and flaws of making students memorize, but there are just some instances where students do need a foundation of knowledge before they can move on to more advanced, critical problems. When I notice students struggling with the content, my first recommendation is to make flashcards. There are quite a few options for making and using flashcards, but they all have the same basic theme: a term or image on one side where you can flip the card and see a definition or label. 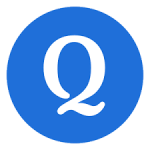 Quizlet: I love Quizlet flashcards, and for your digital learners who can’t seem to part with their phones, quizlet is a great way to get them to practice vocabulary. I have an entire folder filled with anatomy quizlets you are welcome to peruse and copy to your own folders. Also, once a flashcard set is made, students can use them for practice quizzes and even competitive games. Kitzkikz flashcard creator: this creator allows you to place words and definitions into a form field and then it creates a pdf file that can be cut and folded. 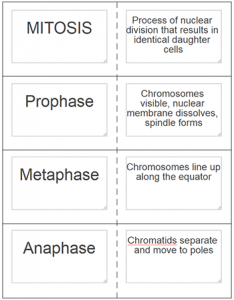 This set on mitosis was created with kitzkikz. Lakeshore Learning Flashcard Maker: This one is a bit more polished than Kitzkizs and you can see the flashcards as you make them, also downloadable as a PDF. Number of characters are limited though. Google Docs Template: If you want students to create their own in class, you can provide this blank template for them. Alternately, you can share the document to them within google classroom and they can type their won. To save your own copy, go to “file” and choose “save a copy” to your own drive.